For me, carrots just have a certain je ne sais quoi…something about them that just shouts spring! Maybe it’s the freshness and the color! In any case, I decided that I needed to create some of my own to add to my spring and Easter décor! My version is super-easy and, since I just used what I had in my stash, they were free! 1. Begin with several paper towels (I used three for larger carrots and two for smaller ones) to form your carrot base. I first folded them in half lengthwise, then folded the top third down to create a fatter top section. Next, I twisted them into a carrot shape and finished them off by wrapping tape around them to hold the shape. I stopped about 1/2 inch before the top of the “carrot” and then trimmed off the excess paper towel to create a flat top. 2. Cut a 5 inch x 5 inch square of green felt and cut into smaller strips, stopping about 1/2 inch before the bottom of the felt. Then wrap them tightly and hold with a dot of hot glue. 3. Cut a square of orange felt large enough to cover the top of your carrot and allow for a drop. (Mine are 2 inches x 2 inches.) Then cut a small slit in it and slip the carrot top through it. 4. Create a 1/2 inch indentation in the center of flat top of your carrot base and add a small dot of hot glue. Place the green top in the indentation and hold in place until it’s secure. Then glue the four corners of the orange square to the base with a dot of hot glue. (I always use a bamboo skewer while working with hot glue to avoid burns.) Next, cut a slit in the middle of one of the four sides, lapping one side over the other and hot glue in place. Repeat for the other three sides. 5. Now you are ready to wrap your carrot base. Cut a strip of orange felt 3/4 inch wide and approximately 45 inches long. You may not need the entire strip but you don’t want to have to piece it. Begin at the bottom, wrapping and securing with small dots of hot glue as you go. 6. Once you reach the top, cut the felt so that it is rounded and then wrap and glue in place. 7. Here's the finished product! Mine are all about 8 inches long, not counting the tops, and vary in "fatness" by the number of paper towels that I used. I love the way they look a little irregular…like real carrots! I can’t wait to add them to my spring and Easter décor! Baby Kitty, however, is more interested in the bunny! Yikes! And just in case you missed it, I showed you how they look in my simple Easter centerpiece, starring the Easter bunny himself! 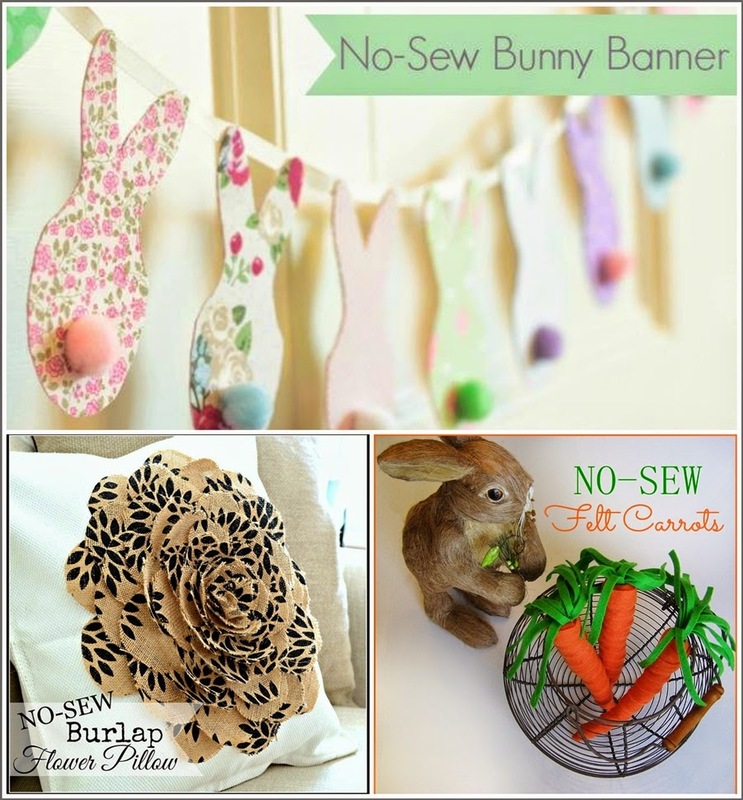 And if you would like even more fun and easy ideas, here are 10+ no-sew projects with bunnies and burlap for spring! There’s a little bit of everything so I hope you’ll hop on over and take a peek! And don't forget to hop on over and check out the other no-sew projects for this month from the talented ladies in the No-Sew Showcase! Really cute, Debbie, and great directions. Super cute and really easy! I love that combo! Great! So glad you took the time to take photos and share this project. 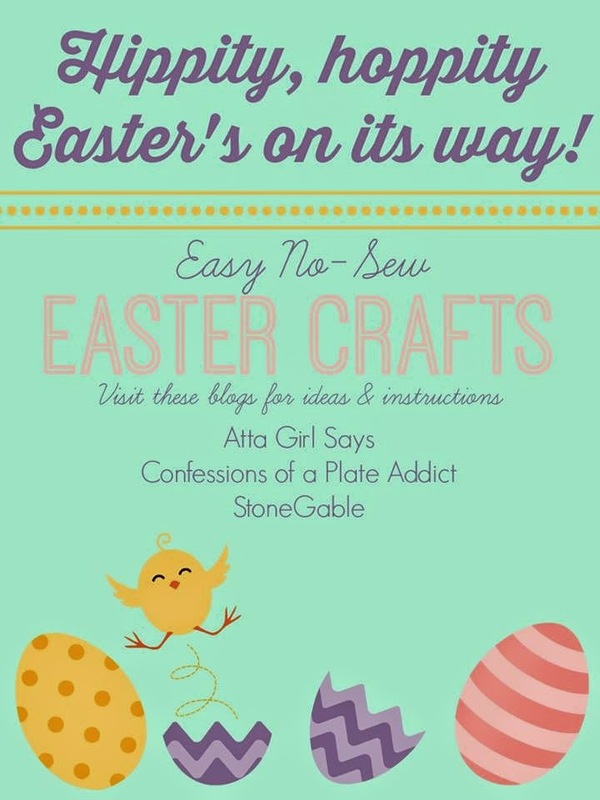 I will be making some for an Easter vignette. So, so "no sew" adorable!!! Debbie - these are too, too cute! I wanted to make some last year and never took the time to figure out how to do it. So glad that you showed me how! How adorable! I love these cuties. Thanks for sharing how you made them. Happy hoppity!